The children’s theatre devised ‘What’s In The Box’. It looked at how memories of friends and experiences mean we take the past with us everywhere we go. Their piece centred around a brother and sister preparing to move home, in which their toys came to life and took them on a fantastical journey. Along the way they learnt that although they were moving their possessions from one place to another, the most valuable things are separate from the material world. A routine about a stuffed frog was especially delightful, with pop music video moves and a repetitive chant of ‘ribbit ribbit’. 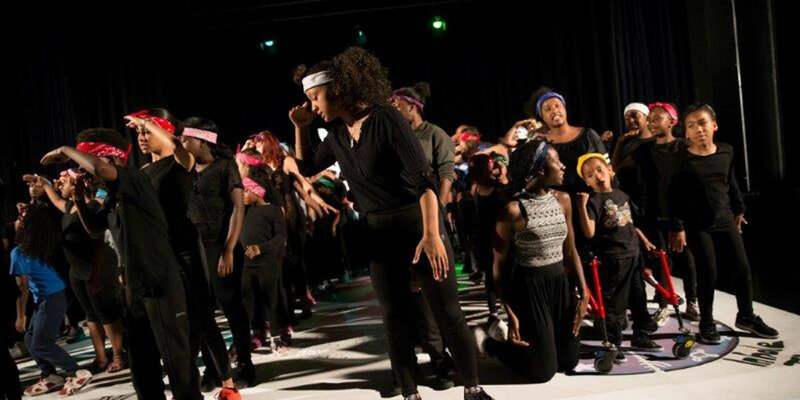 The youth theatre’s show, ‘Strings’, focused on the wider, global picture. Some of the performers wore masks which covered half their faces, Phantom of the Opera style. They represented the dark side of capitalism and society, whereby one group controls another for financial gain. Issues like the 99% and political agendas in the media took centre stage. The play was intense and hard hitting, with elements of comedy. It was clear the performers were passionate and enthusiastic about their message, and the artfulness with which it was delivered. Both productions combined acting with fresh choreography and original songs, to create something upfront and infectious.